Grace in Small Things: 4/365 | A Daily Dose of Zen Sarcasm! MY BABY!!!! !, originally uploaded by Madame Meow. 1. This picture. It cracks me up and gives me a warm fuzzy at the same time. 2. Legos. Only the awesomest toy ever. 3. Firefighters, really. I mean, all kidding aside, aren’t you glad there are people willing to brave flames for you? 4. Christmas lights and decorations that make everything look twinkly. 5. Snow! Even if it’s just a tiny little bit, it’s so romantic and pretty. Bonus: Did you know that if you put the lime in the coconut, then you’ll feel better? No need to wake up the doctor. 06 Dec	This entry was published on December 6, 2008 at 8:27 pm and is filed under Grace. Bookmark the permalink. Follow any comments here with the RSS feed for this post. LEGO! 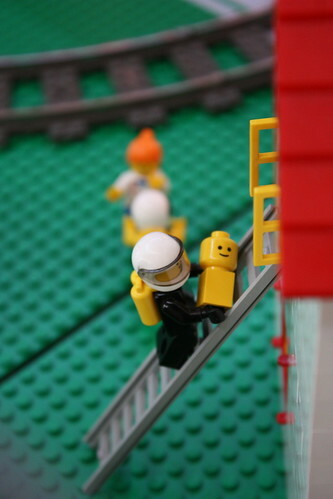 Have you seen the offical Legoland site? It’s so cool!! When we were living in Toronto there was this one store that always had a huge lego sculture in the main window. Words fail you when you’re looking through the window at a 7-foot high green and brown dinosaur made from lego bricks. Although when they did the Christmas tree it took a minute to realize it was made from lego. Lincoln Logs are cool, but LEGOS kind of blow them out of the water, El Ghosto. They just do.